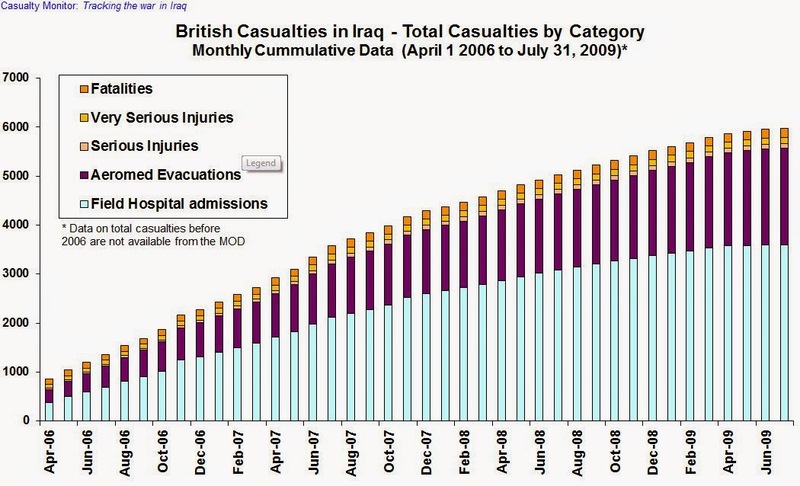 Below, we present a series of graphs that show the available official UK Ministry of Defence (MOD) data on casualties in Iraq. The MOD stopped releasing casualty updates after July 2009 which is where our analysis also stops. We hope that making the data available in this format will aid people in understanding the casualty burden experienced by UK armed forces, provide an indication of the trends in the conflict, and also expose the continuing need for the MOD to improve their performance in providing full and accurate information on casualties during conflict. Our ongoing analysis of casualties in the war in Afghanistan is also available. During the conflicts in both Iraq and Afghanistan, the British Ministry of Defence (MOD) has been reticent in publishing details of British casualties, as well as figures for casualties of other nationalities. Previous efforts to improve transparency and accountability have been documented on this site along with debates in academic journals, and attempts by the mainstream media to ascertain the true extent of the casualty burden. Over the last few years there have been improvements in reporting and the MOD does now publish fortnightly updates of casualties for Afghanistan. However, there are still serious problems with the accuracy and incompleteness of the information they release. NB To enlarge the graphs for easier reading click on any of the images. 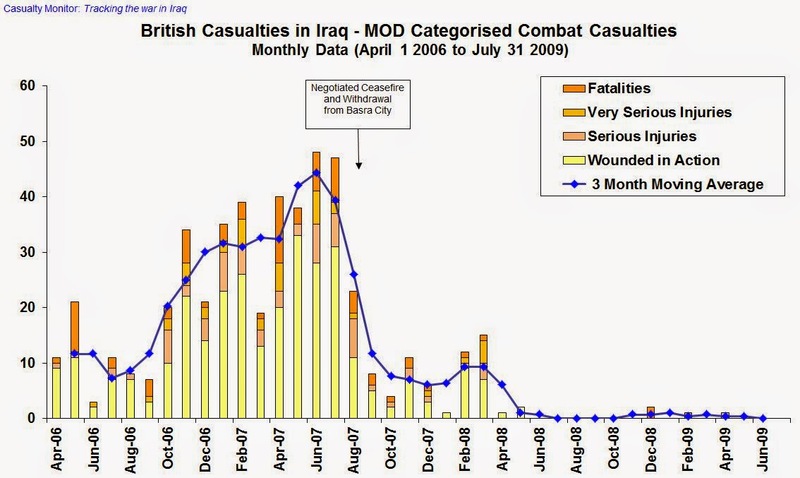 The first chart provides a monthly breakdown of casualties officially recorded by the MOD as being due to direct action, i.e. fighting. As information was only made available on a monthly basis by the MOD from April 2006, the figures are shown from this date onwards. We now also know that the data that was provided by the MOD is far from complete, so the absolute figures presented here should be treated with caution. However, what these data are useful for is assessing trends in the conflict. The 3 month moving average indicates a marked and steady increase in the intensity of the conflict from September 2006 up until the ceasefire agreed with the main elements of the resistance in the south, and the withdrawal of British troops from Basra City in September 2007. British casualties rose steadily up until the withdrawal and then fell very sharply as the fighting abruptly diminished with a small peak associated with fighting in early 2008. Since then casualties have remained very low with no combat fatalities reported since February 2009. The second chart shows the figures for total casualties reported by the MOD. Due to the way the figures are presented in the MOD reports, it is impossible to be sure whether, and to what extent, double counting may be occurring. For example, soldiers admitted to field hospitals may also be classified as serious or very seriously injured, and could also, in principle, be counted in the aero-medical evacuation figures. However, from the publicly available data it is just not possible to know and we therefore present the sum of the different categories. As such, the figures represent the upper range of the official total casualty count. Nonetheless, the data illustrate that from since the beginning of 2006 until now, total casualties may be close to 6,000. These data are also tabulated below. This total casualty figure is not necessarily excessive - indeed, a figure of 6,700 casualties was previously reported for the period from the invasion up to March 2006. Interestingly, the data on which this earlier assessment was made is no longer available on the MOD web site. The third chart summarises the available data on fatalities, serious, injuries and very serious injuries since the war began in March 2003. A marked decline in these casualties is seen following the invasion until 2005. The trend reverses in 2006 and accelerates during 2007. 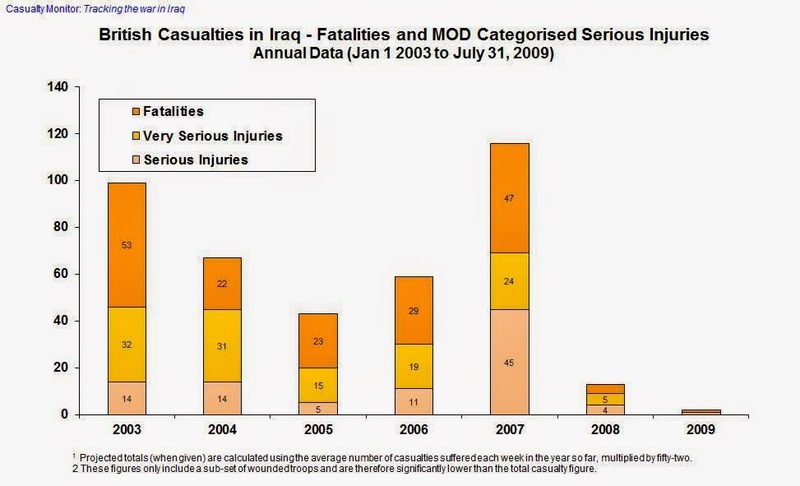 Casualties in 2008 and 2009 have remained very low up to the end of MOD casualty data reporting. Lastly, the table below provides a summary of the official MOD figures on British casualties.